Rodden's Bar, Main Street. Buncrana. Co. Donegal - 20th June, 2014. The gig starts at 10pm and goes on until Midnight. 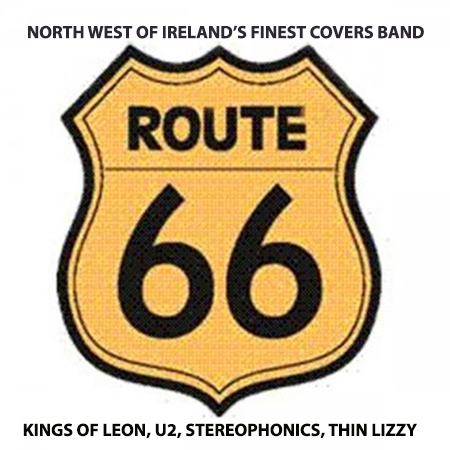 Route 66 are the North West of Ireland's finest live covers band performing a wide range of songs by acts such as: Cheap Trick, David Bowie, Doobie Brothers, Eric Clapton, Gary Moore, Horselips, Kings of Leon, Razorlight, Red Hot Chilli Peppers, Snow Patrol, Stereophonics, The Clash, The Killers, Thin Lizzy, Tom Petty, Tom Robinson, Undertones, U2, Van Halen and The White Stripes. The band gig extensively throughout Co. Donegal and also regularly feature up at the Gweedore Bar on Waterloo Street in Derry. If you're a local or a tourist looking for a great night's craic and music then Route 66 are definitely the band for you.